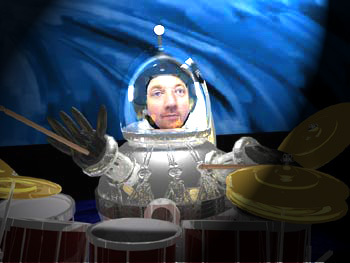 And.D is the Molecules (and Strangefates RL) most recent drummer taking over from the Robot Alien in the late nineties after having his hand successfully sown back on after a freak accident in a nightclub in Chester. Unfortunately he had his hand sown on the wrong way round, but this led to some useful time signatures being played that otherwise could only be played with a drum strapped to his head. Andy has spent much time developing his Drumkit Wonderland Studios in Hawarden, North Wales, in particular by investing in a sound proof fridge. 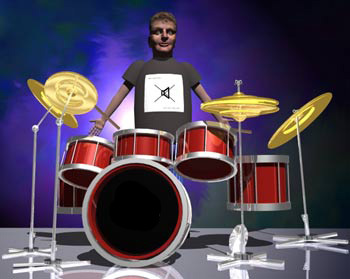 His drumkit has been converted to electronic Roland V Drums. They look fantastic, but boy if you look inside them, they're nothing more than a cheap sensor from Tandy glued onto a bit of plastic. Never mind though, they still do the business, and it allows And.D to perform and record without waking up his neighbourhood. What a gentleman. And.D is also executive Producer of the Bouski Songs, insisting on wearing shades to soften up the light of the song, and to hide the occasional nodding off during long sessions when Dave is attempting to record a solo. And.D learnt his chops roadying for drummer 'Bomber Harris' in Prog Rockers 'Horizon'. He was eventually encouraged to join a band with school friends called 'Troll' (we think it was a "Rush Thing"). His first kit consisted of bits of old kits bought up for forty squid. The rest of the kit had to be improvised with upturned large washing powder tubs and an old wire milk crate for the hi-hat: cymbals were a mere distant dream. Regardless of the lack of kit, the thought of of replacing Peter Cross from Kiss drove And.D on and using the kit he recorded the one and only demo tape: Troll's Finest Hour'. On hearing the result, the band split up.And.D managed to sneak his kit into the house without his parents noticing. This time he had purchased some real cymbals. The neighbours were later heard saying 'we thought the aliens were coming' and the complaints about the noise escalated. And.D was finally allowed to practice at tea time for an hour between 5 and 6 pm. So he was never to see an episode of Crackerjack on TV. In 2006 And.D recently refurbished his Drumkit Wonderland Studios with an upgraded beer fridge. Bouski, Molecules and Strangefates sessions reconvened in 2007. They they acctually got round to playing some music. 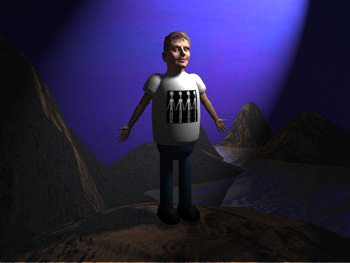 Bouski performed some rare live gigs late 2008 within the virtual world: Second Life (SL). And.D is continuing to perform as lead Real Life drummer for Strangefates, and the Molecules.